The Lawers range provides some fine running opportunities. 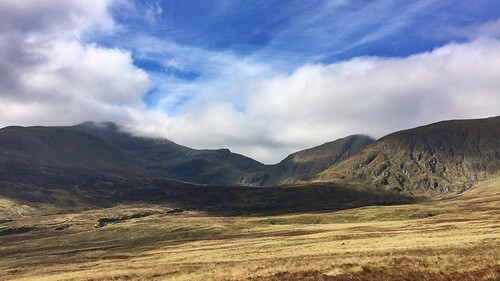 While easily accessible, at 1214m Ben Lawers is 10th tallest hill in the UK, making it popular with walkers, runners, mountain bikers and skiers. 12km / 800-900m ascent (depending on route); allow 2h. The ridge joining Beinn Ghlas to Meall Greigh provides for first rate run on excellent surface allowing for good pace to be maintained. I have shied away from attempting this for a long time, thinking this would either require the use of two cars, or finish with a long road leg, but in fact an excellent, entirely off road, loop is possible. Start from the NTS car park. There is a good water source just off the path as it leaves the deer-fenced enclosure at the foot of Beinn Ghlas, which is also the last decent water source for the duration of the ridge (on the lower path, water is also available in the N coire of Beinn Ghlas). Upon reaching Ben Lawers summit, the walkers path to An Stuc takes a sharp left (NNW) turn, follow it all the way to the summit of Meall Greigh. From the summit descend the open hillside aiming for the small dam at the top of Lawers Burn (NN 662 427). Below 800m the hillside is cut by numerous, often invisible, streams and is somewhat damp, but otherwise good, underfoot, allowing to reach the dam in about 20min. From the dam take the waterworks service track, which provides for 'as fast as you want' running on an easy surface. Where the track starts descending down the glen, a new section, not on the OS map, continues for another 1/2km or so to Allt an Tuim Bhric. Take this to the stream, then scramble up the steepish grassy bank to gain the open hill on the other side. From here start a raising traverse aiming for the 650-660m contour line, then stay on it contouring the hill. The grassy ground is surprisingly reasonable, neither boggy nor tussocky, allowing for moderately fast shuffle. Turn the shoulder into Coire a' Chonnaidh over (or just above) some peat hags. Coire a' Chonnaidh is well used for sheep grazing, and a faint, runnable, sheep track soon emerges following the ~650m contour line. Take this as far as it goes (or just follow the 650m contour line), aiming for a rusty gate at NN 620 389. From here the walkers path should be visible; continue contouring to reach the path above the deer fence gate, and take this back to start. 24km / 1550m ascent; allow 4-5 hours. This loop takes in Beinn Ghlas, Ben Lawers, An Stuc, Meall a' Choire Leith and Meall Corranaich. It is an excellent outing with a properly remote feel once you leave the main Lawers ridge. Follow the main Lawers ridge run, as described above, to the summit of An Stuc. From the summit descend along the NNW ridge. While the ground (and the remoteness of this side of the hill!) does not lend itself to a very fast descent, it is not particularly onerous.The natural line will take you to the Fin Glen stream somewhere around the 550 - 600m contour line, then follow the stream to the floor of the glen. Continue down the glen (N) along W bank of Allt a' Chobhair to near where a landy track comes up to the shielings (around NN 625 453). From there climb the hillside on the W, aiming for the flat area of Sron Eich. Once on the ridge, head up to the (flat) summit of Meall a' Choire Leith (cairn); you should be able to pick up a thin path which becomes more distinct beyond the summit. Follow this path over to the summit of Meall Corranaich, and then beyond (not shown on OS map) descending in ESE direction into the bealach between Meall Corranaich and Beinn Ghlas. From there (around NN 620 407) take the well defined walker's path back to start. 23km / 2000m ascent; allow 5-6 hours.